Its quite amazing how altering the background colour can make the appearance and appeal of my work change dramatically. 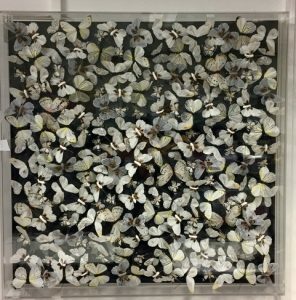 In the case below, I much prefer the black background against the white butterflies but whether or not you agree with me, the difference in the “look” is quite dramatic. I wanted to add prosperous to the title but I’m a bit reluctant to tempt providence. Most of the hearsay indicates that business is stuttering at present and has been so since the latter part of 2018. Fortunately I was pretty busy between September and December but then it doesn’t take much to keep one man occupied. What the next few month holds is anyone’s guess including mine. Having said that I’m pushing ahead with new ideas, fresh designs and concepts in order to keep up momentum. I’ve revised the lower priced box layout but am still not happy with it. It doesn’t shout at me yet. Here’s an image and if you’d like to comment I’d love to hear from you, good, bad or ugly. This one is 16” x 14” but the final designs will be larger. 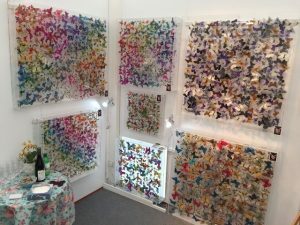 I have taken the last quiet couple of weeks to revise the layout of my studio making it homely as well as more efficient, after all I spend at least 5 days per week in it. I want it to be attractive and comfortable which it’s beginning to look and feel now. Best wishes to Subversion Gallery in Glasgow who have recently agreed to be stockists. I’m waiting on some gallery images to post in due course. 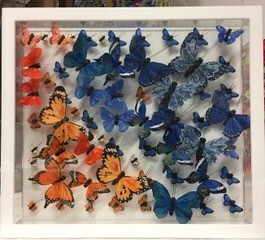 Also adding to the growing family of Michael Olsen butterfly art stockists will be Driftwood Gallery in Cornwall. They will not be on stream until February so more on this nearer the time. I recently became excited when I had an online enquiry that eventually resulted in a firm order. Payment was requested and despite warning bells that arose during the preamble, I decided to cautiously see it through. A cheque arrived and was for more than twice the amount requested! Yes very odd but my contact didn’t seem overly worried and told me that I could refund him the overspend when I was in funds. I’m sure you’ll guess but the cheque bounced and I was later informed that it was fraudulent or counterfeit. 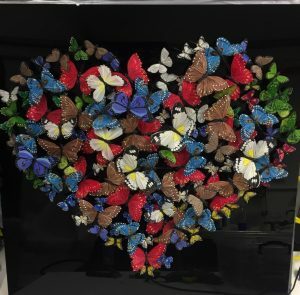 Either way, I’m relieved that I wasn’t scammed and that I still retain the lovely heart-shaped butterfly box he ordered. Business continues to progress and I have a head full of ideas and projects for 2019 to continue that upward momentum. L’homme Bleu was re-worked into a frame and looks pretty good as you can see. The client is happy and therefore so am I. A week of rest, sleep, walks, juicing and detox should have me up and at ‘em with vim and vigour. Instead of that, my energy is very low but I did lose 10lb in weight so all is not lost. 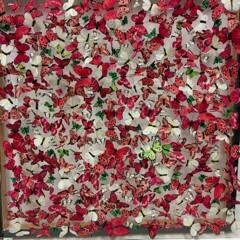 I’ve created an installation for Christmas predominantly in red but with some green and white and is 100x100cm. It’s going to Zebra Gallery in Hampstead for exposure to the refined punters of NW3. 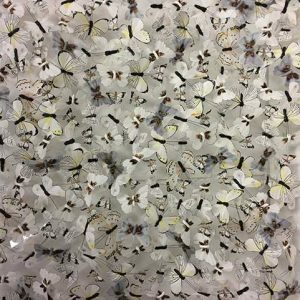 New butterfly supplies recently arrived from the US including for the 1st time folded wing varieties. This is all very exciting as new colours and designs fuel my creative juices. 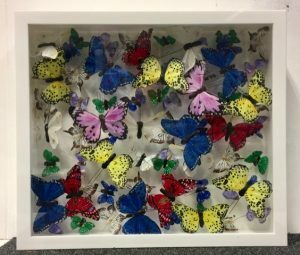 Some of these butterflies which are smaller will be perfect for my new lower priced variation of the standard butterfly box. I’m aiming to sell the new creation for £500-£600 and the revised & completed prototype will be with me later this week. Another sneak peek this is quite small at 60x50cm approx. Enfin mes amis, L’homme Bleu has not quite been sold, despite my last blog. 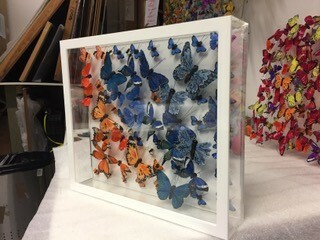 Apparently the client who adores the piece wants to place a frame around it which is an idea that I have had for a long time. I shall be intrigued as to how it will look if this particular project goes ahead. Not quite but close. 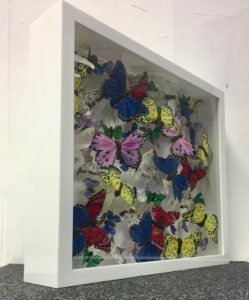 It seems that exhibitions are not the place for me and my Butterfly Art. I rushed to Chester Art fair in order to offload the cavernous van, fit all of the boxes on my stand in time for the 3pm deadline. Check in at the B&B and then back to the exhibition in time for the private view. Lots of oooh’s and aaah’s but no sales from Friday evening until Sunday afternoon. Boring, disappointing,frustrating and expensive. I won’t say never again but will research the target audience if I dip my toe in again. The bright side? I spent lots of quality time with my lovely wife and met a very successful gallery owner who might take on my art in the west country. The latter could make the whole thing worthwhile. time will tell. I’m taking a well earned rest this week at a Somerset retreat. Rest, relaxation and sleep. And breathe………. In my October blog I posted an image of L’homme Bleu. I’m happy to announce that subject to confirmation, this piece was sold by Wyecliffe Gallery last week. This is a really important moment for me as the sale confirms to me that my work of a more artistic nature has been accepted by the public. November has been a really positive month for me despite Chester. Sales and enquiries are up and so am I. Just a quickie this week. There’s not a lot to report other than me getting ready for Chester which has been quite amusing. Here I was worrying whether the van I ordered to take the 14 odd boxes to the exhibition was going to be large enough. I need not have wasted the energy. Without asking I was upgraded to a van large enough for me to sleep in if I was so inclined. It’s massive and now that the angst has subsided, I have to smile. I just hope it comes back empty with everything having been sold. Yeah right. Anyway, that’s it for this week but here’s an image of a panel I just made and love and decided to share with you all. I just don’t get it! All of the uncertainty surrounding the Brexit negotiations have in the past been used as an excuse for business being very quiet. And until October that’s just how it was for me, QUIET. However, and confounding my ‘wisdom’ I have had an amazingly busy October. Sales are up, enquiries are up and with, not unsurprisingly so is my mood. With Chester Art Fair just around the corner, I’m hoping for great things. New ideas are in the process of developing in my mind and I now have to put them into something concrete so that the positivity flying around, translates into some great work. I’m starting to work with a new acrylic fabricator who is very much on my wavelength. This association should make the process of concept to the finished article much more streamlined. I’ve now appointed a PR company to spread word of the Michael Olsen brand and further increase interest in my art. Lydia Drukarz of “wavelength” is an experienced PR practitioner and I’m hoping for great results from her activities. There has been lots of very positive feedback & interest in the image of ‘Lhomme Bleu’. Hopefully, that will translate sales. I’m now getting all the stock prepped for Chester which will be a much shorter show at 3 days, than the Kew debacle. Fingers crossed. Held over the previous week, my one-man exhibition at Canvas Gallery in Winchester was a great success with a number of works being sold. I attended the opening day and met a number of the galleries clients who wanted to meet the artist, that’s me! That’s the bit I enjoy the most as I rarely have the opportunity to meet my buying public. Now I’m preparing for my last show this year which is to be held at Chester racecourse. 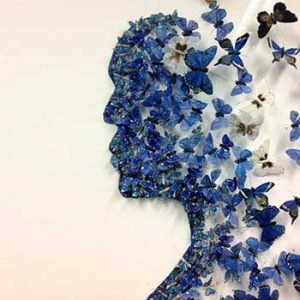 This is an all art exhibition “Chester Art Fair” that will be held from November 16th-18th. Not surprisingly I’m hoping that this will be a greater success than Kew was, but it wouldn’t take much to trump that! I will be taking 12 pieces with me covering the range of sizes and new colourways and designs. Social media continues to attract growing interest and along with it, I’m considering a PR campaign for 2019. Work on the lower priced version of my art continues. Here is a sneak peek of a prototype. With the disappointment of Kew’s lack of sales behind me, I’m preparing for my next exhibition. It is to be held at Canvas Gallery Winchester and run from next Saturday, October 20th until Sunday 28th. 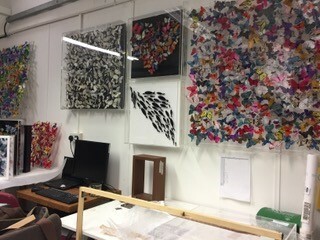 Apart from Kew, it will be the largest collection of my works to be shown in one space. I will be on hand to meet the public on Saturday between 2 and 4 so if you have the time please come down. Canvas Galley 169 High St. Winchester SO23 9BQ. My ‘What’s New’ page is now up and running on my website so please check it out f you’re so inclined. 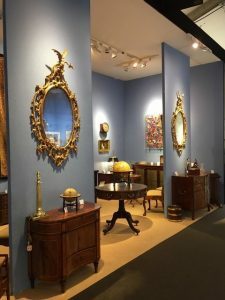 As you might know from a previous blog, my work was recently showcased at LAPADA exhibition Berkeley Square. You’ll see from the following image one of my works peeking around the corner. 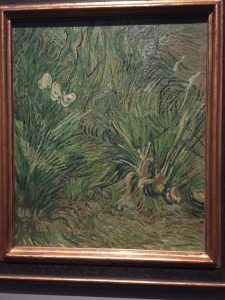 It illustrates so clearly how the traditional and the contemporary genres dovetail seamlessly and compliment each another. What great exposure for my work in such a prestigious location. I received new enquiries for commissions during the past week, one of which is being delivered to its home in Sussex later in the week. 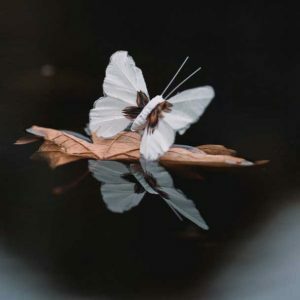 Here’s another wonderful image of one of my feather butterflies, taken through the creative eyes and camera lens of Stefan Hanegraff. As well as my social media activity, I’m now considering trialling a publicity campaign. This will depend upon cost but could be a valuable tool in getting my name and Art to a wider audience. Last week was spent preparing for and showing at the Handmade at Kew exhibition. The preparation was hectic and stressful as this was my first show and I didn’t know what to expect. Set up was easier than I had thought and my stand looked very good as you see from the attached image. The show was well attended but the attendees were not ready for my art. I have a couple of good leads to follow up but disappointingly, no sales were made on my stand. Exhibiting is very tiring and by Sunday evening I was exhausted. The rest of this week has been spent cleaning and re-wrapping the boxes in readiness for my one-man show being held at Canvas gallery in Winchester starting on October 20th. On the plus side, I received a number of commissions since the start of the month and that is encouraging for me. I need an order or ten to keep my spirits up! Next week sees my ‘Blue Man’ placed on display at Wyecliffe in Walton on Thames. 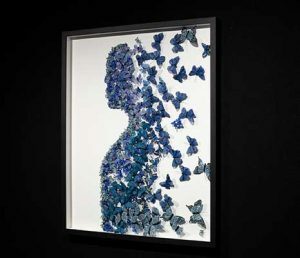 It’s a new design which could signal a departure from my standard Butterfly installations. 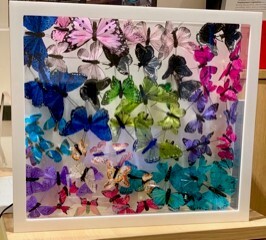 I’m also getting ready to make the butterfly of butterflies mentioned in last weeks blog. Finally, I’m creating a new page on my website dedicated to new products and designs. Please do keep an eye open for it and I hope that you’ll be as excited as I am when it’s published.